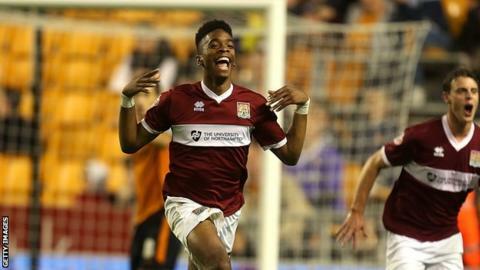 Newcastle United are closing in on a deal for Northampton Town striker Ivan Toney, reports BBC Radio Northampton. The 19-year-old has played 60 times for the League Two club and scored 13 goals in total since coming through their youth ranks. Toney has attracted interest from top-flight and Championship clubs, reportedly failing a medical before a proposed move to Wolves in 2014. He is due to be in Newcastle on Friday ahead of any potential transfer. The Premier League club have already signed defender Chancel Mbemba,striker Aleksandar Mitrovic and midfielder Georginio Wijnaldum this summer.